Easy to handle. Dialog boxes to design drawing elements easily with a database function to improve work flow. A layer technique which is flexible to employ. It simulates working with transparency sheets. HTML online help, illustrated with many graphics. Graphical user interface based on GTK (The Gimp Toolkit). 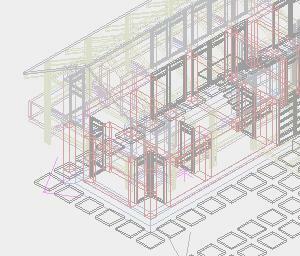 Intuitive working in the ground plan, elevation and isometric views. Computing graphics such as hidden line graphics or wire graphics from various perspective or isometric views. Direct export to POV-Ray [TM of the POV-Ray Team] module to generate high-quality rendered images easily. Extendable Material database to support output of 3D data to renderer. Hidden Line pro is a CYCAS special rendering hidden line graphics with silhouettes, smoothing, or dashed lines. DXF is a data exchange format for moving CAD-data between various CAD programs. 3DS enables import of 3D data in the 3D Studio format. POV enables export of 3D data to the Persistence of Vision raytracer. EPS enables export of 2D data as vector graphics to Text- or DTP-programs. SVG enables export of 2D data as vector graphics for display on the internet. PDF enables export of 2D data as vector graphics for multifunctional usage, such as printing, further processing in e.g. DTP-programs, etc. LWO enables export of 3D data in the Lightwave file format. HPGL, HPGL2 enables output to plotters in all sizes and in high quality.